Growing up in Port Townsend, I was lucky to live fairly close to three fascinating state parks: Fort Worden, Fort Flagler, and Fort Casey. These were coast artillery bases, positioned to form a “deadly triangle” at the entrance to Puget Sound, to protect the naval bases further into the Sound. They were constructed at the turn of the 20th century–from around 1897 to 1903. Each fort had a series of concrete bunkers and artillery pieces facing out to the straits, and barracks and houses for the enlisted men and officers, respectively. Plan for the power house, Fort Worden. Fort Worden barracks, looking South from Artillery Hill. 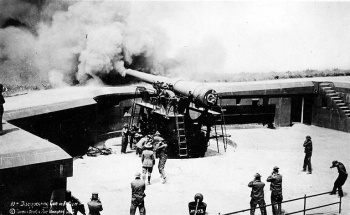 The forts became obsolete fairly quickly, as the technologies developed during the First World War meant that aircraft could put the stationary artillery pieces out of action without much trouble. Even during the war, some of the artillery pieces were removed from these forts, shipped to Europe, and converted to railway guns. However, the forts remained under the control of the military until the ’60s or so. 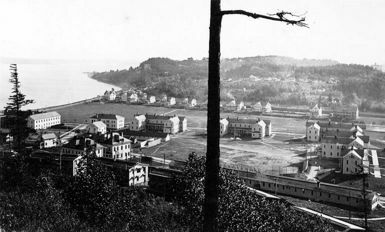 At some point thereafter, Fort Worden was turned into a sort of reform school for a while, with its barracks housing delinquent youth. After that, it and the other two forts became state parks, with most of the bunkers open to the public. Firing one of the guns, Fort Worden. Firing a mortar, Fort Worden. The early history is fascinating in its own right, but its role as a source of inspiration for me comes more from the forts’ “afterlives.” Although the guns and equipment have been removed from almost all the bunkers (with only a few examples left at Fort Casey), the concrete buildings are mostly intact. Some had traces of their old fixtures, and occasionally some stenciled lettering on the walls. There was a low-level but constant application of graffiti. In fact, early on, some of the bunkers in fort Worden were in a remarkable state of benign neglect, perhaps because they weren’t easy to find. I remember in particular one set of underground rooms, with an entrance hidden away in the woods, that the park staff had somehow neglected to lock up. For an adventurous kid, it was a really exciting experience to gingerly descend the old staircase into a pitch-black, asbestos-smelling room with old rusty machinery in it, my flashlight revealing graffiti of a much higher quality than one fond in other parts of the bunkers. There were old burnt-out candles and bottles scattered around–from either a pseudo-Wiccan ritual or a D & D match, I guessed. I will never understand why the park left that room open, but I’m really glad they did. It was a rare bit of excitement and perceived danger in otherwise far-too-safe Port Townsend. It was also a place I could proudly show my friends, something weird that I had discovered. For a while, I walked there almost every day during the summer. Of course, now they have locked those rooms off, and started “restoring” them to the way they looked in the Second World War, when they controlled radar and magnetic apparatus for the Navy. A nice old volunteer from the Coast Artillery Museum showed me around one day when they were open, and taught me a lot about the purpose behind the building. Indeed, when I was very young, I had always wished that some of the bunkers were kept in the same state they were in during their early days. However, I was very sad to see that they’d chosen this bunker to “restore.” All the graffiti was painted over, and all the signs of vaguely illicit youth activities had been scrubbed from the floor. The smell of old asbestos insulation was replaced by the smell of fresh paint, and forty or fifty years of activity had been essentially erased from the room, in the interest of showing people the history that the Coast Artillery Museum considered important, which is to say the military history. I’ve always been a military history buff, and so really I should be grateful that the museum has gotten serious about exposing more people to it, but at the same time, the more recent significance of that room–as an example of the bunkers’ significance to the generations that grew up playing around in them–has been subsumed under the desire to express an official history. This entry was posted in Sources of Inspiration by jossw. Bookmark the permalink. that is great article, but where is the photo to complete the content? What a unique and fascinating experience, Joss. Reading this, I couldn’t help but imagine you as a young Howard Carter descending into a darkened room full of (relatively) wonderful things. Your story speaks to, I think, the distrust many communities feel toward archaeologists (that article we read for Dr. Wylie’s class on reuses of ancient Greek sites by local populations sprang to mind). For people who have established and often personal connections to specific places/sites/buildings, the arrival of archaeologists searching for “fuller understandings of the past” can ironically lead to a flattened history confined to a very particular narrative. As you say, archaeological studies and restoration efforts no doubt provide interesting and relevant information, but to what extent they erase local histories is an important question to ask.